Computer desks come in all makes, sizes, and shapes. The L shaped & U shaped computer desk styles provide a practical purpose for your home office. Shaped desks provide a way to position your desk conveniently into the design scheme of the room decor. Whether for style or for a practical way to save space and storage, an L shaped desk or U shaped works well. U shaped desks are good for creating a working area that lets you multi-task and keep enough area for the busy person. L shaped desks are great for corners in rooms for the home or office. Both desks allow you to have plenty of space for a computer, printer, and other accessories without clogging up your working area. 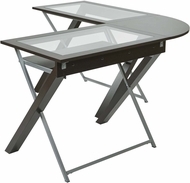 All of our L shaped & U shaped computer desks are sold at discount prices, with free shipping.